Cool roofs are not tricky. They are what they claim to be: roofs that are cool in temperature. So although the concept is simple, the result is a very powerful tool for architects in the growing need and desire for greener buildings. 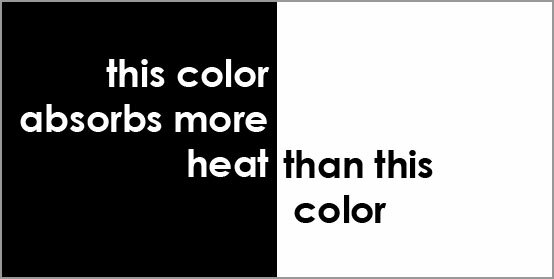 a) reflecting heat from the sun (called solar reflectance). b) quickly re-emitting any heat that is absorbed (called thermal emittance). In essence, the goal of a cool roof is to reduce the amount of heat entering the building. 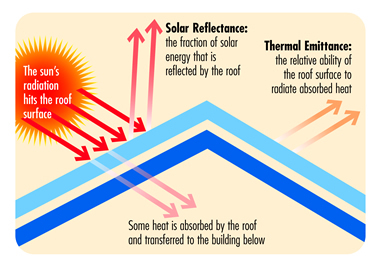 As seen in the diagram below, these two properties, solar reflectance and thermal emittance are what determine if a roof is technically cool. Diagram courtesy of the lovely people at the Cool Roof Rating Council. Get it? White roofs absorb less heat than dark-colored roofs. A cool roof only absorbs 10-15 percent of the sun's heat versus 90 percent heat absorption for a traditional dark roof. The beauty of cool roofs is that they're a low-tech concept. Long before the days of electricity and air conditioning, warm-climate areas used light colors in their buildings to reduce heat gain. 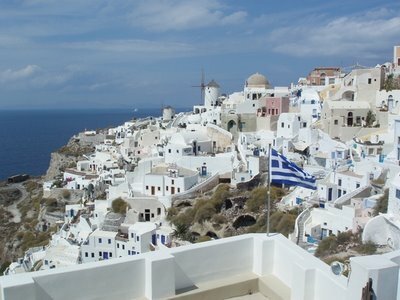 I think I even wrote something about this last year called Environmental Architecture in Greece. In Santorini, Greece, cool roofs (and walls) are not a new idea. However, since people don't always want white roofs, some smart scientist types have figured out a way to have cool roofs with darker colors by utilizing special highly reflective coatings. Cool roofs are versatile, coming in all types of materials that can be applied to a home just as easily as to an office or industrial building. Inevitably, the first question we get after we describe a green feature to a client is "That's great, but is it more expensive?" Thankfully, for cool roofs, the answer is "not really." The added cost for a cool roof can be as little as 15 percent. This minor increase is far outweighed by the projected 20 percent or more savings in air conditioning cost (source). Besides, knowing you have a cool roof and are helping the environment will make you feel warm and fuzzy inside. Compared to other green building features with high upfront costs, such as solar panels, cool roofs are an affordable option. Don't be selfish when selecting a new roof. Having a hot roof not only increases your cooling costs, it also affects the world around you through an ugly phenomenon called heat island effect. Heat island effect occurs as result of the numerous heat-absorbing surfaces that cities contain such as dark colored roofs, streets and seas of parking lots. This effect overheats urban areas, increasing the demand for air conditioning and electricity. Another not-so-fun aspect of heat island effect is that it's known to increase smog formation. 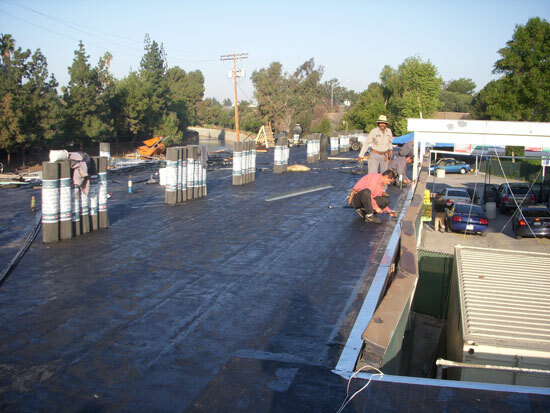 Whereas many green building features are better suited for new construction or extensive remodels, cool roofs are a viable option for any remodel or simple re-roofing. 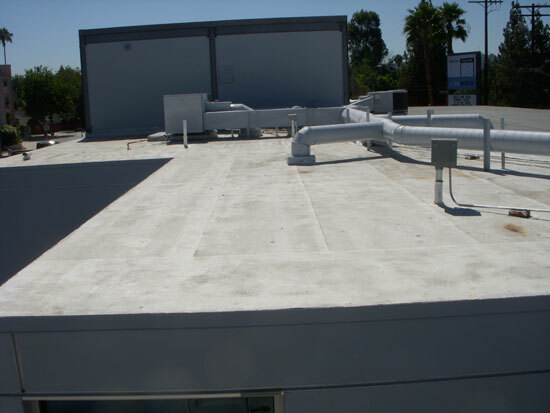 On our recent remodel of the Fashion Square Car Wash, we specified a cool roof to reduce the air conditioning loads and heat island effect from the surrounding paved areas. 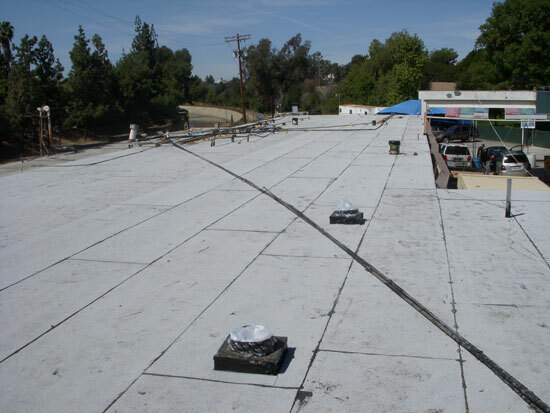 The re-roofing of the Fashion Square Car Wash started out looking very similar to a typical roof. So far, not very cool. Now there's a cool roof. So in this case, the roofing was pretty standard, but in the end it was covered with a white coating to increase its reflectivity. There is a fair amount of debate as to whether cool roofs are beneficial in all climate zones. For us here in Los Angeles and other warm climates (hey Texas, Nevada and Arizona), it's a no-brainer: cool roofs work. The worry in cooler climates is that cool roofs don't allow for thermal gain in the winter. The good news is that there are numerous studies that have shown that cool roofs are effective in just about any climate. Potential net energy savings from changing roof reflectivity. Savings are measured in dollars. Note that the net savings are the savings of cooling energy use less the penalties of heating energy use. Image courtesy of the Heat Island Group. If you have any thoughts on cool roofs, feel free to leave a comment or send us a fancy form message.